In 1994 Friends of the Columbia River Gateway was formed to provide volunteer and financial assistance to the Washington State Parks and Recreation Commission in maintaining and enhancing the historical areas. 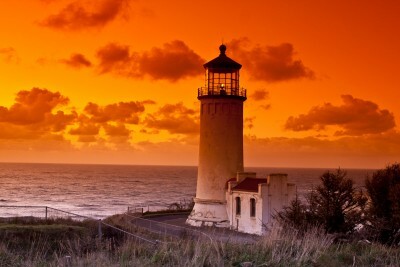 One of the historic holdings is North Head Lighthouse in Cape Disappointment State Park. We currently generate funds through the merchandise sales of our two retail outlets. One is located in the Lewis & Clark Interpretive Center, Ilwaco, Washington. The other is in the historic carriage house at North Head Lighthouse, which is open summer only. The funds are used to support the Long Beach Peninsula State Parks with interpretive signage, Waikiki Beach concerts and some interpretive programs. During the summer of 2008 graduate students in the University of Oregon Historic Preservation program did a condition assessment of North Head Light House as part of a practical experience in investigation, planning, and research necessary to produce a condition assessment. This report made it clearly evident that something must be done in order to accomplish the restoration and preservation of this historic structure. Hence, in 2009 the formation of the Keepers of the North Head Lighthouse as group dedicated to the sole purpose of saving the structure thus preserving history for future generations. Friends of the Columbia River Gateway is an IRS-registered 501(c)3 organization. You can read more at Guidestar, where you can get IRS data, plus more up-to-date information from nonprofits for free. Support the restoration of the North Head Lighthouse! Become a member of Keepers of the North Head Lighthouse, an arm of the Friends of the Columbia River Gateway, a non-profit 501(c)(3) organization. You will receive a membership card, a beautiful North Head Lighthouse pin and a quarterly newsletter. Contact us if you would like to volunteer! Unfortunately, we aren't able to let you specify a donation amount within our simple little shopping cart. Click the yellow Donate button below and you'll be taken to PayPal where you can specify an amount and tell us more about your gift. We apologize for the inconvenience. Privacy, © & Credits. Please report site challenges.